After being saved (phase one) we must continue (phase two) in the same word that provided the knowledge and understanding that led us to salvation. At the same time, we must avoid the counterfeits and false teaching that can lead us away from the source of salvation. Losing salvation (phase one) is not possible, but failing to grow and produce the fruit of that salvation is a daily danger. Good deeds, godly character and the fruit of the Spirit are products of the seed of the Word of God, the same seed that produced the new birth. In this verse, Peter encourages the early Christians to realize their salvation is a result of the Word of God being planted in their lives. These believers had heard and believed “the word that was preached.” And now that they have been born into the kingdom of God (“newborn babies”) by the seed of the Word of God, he explains that they should “crave” more of that same Word. The Greek word for “crave” is epipothesate (in the aorist imperfect active tense) and means “to long for, to desire, to crave”. This preposition in compound indicates intense desire directed toward an object (Lingustic Key, p. 570). The active tense means that the subject does, or causes, the craving. The verse from 1 Peter ends by assuring the readers that this craving for the pure spiritual milk of the Word of God will result in believers making progress in their salvation. It is helpful to note that it is the healthy baby who hungers, and even cries, for milk. So it is with the Christian. A spiritually healthy Christian hungers for the hearing, teaching and instruction that come from the Word of God. Apostolos (Gr) - Apostle (Eng) - apostolos is Greek word meaning "a delegate," "a messenger." It was used to refer to someone sent with orders from a high authority. It is used 79 times in the Greek New Testament and is translated "apostle(s)" 76 times and "messenger(s)" 2 times, and "sent" once. Do I seek to think, speak and act in wisdom? Or, do I behave in whatever way I feel at the moment? I will seek to discern wise thoughts, words and deeds from foolish ones that produce mere folly. Uzbekistan - strategic key location to Central Asia with struggle between post-Soviet and Islamists. 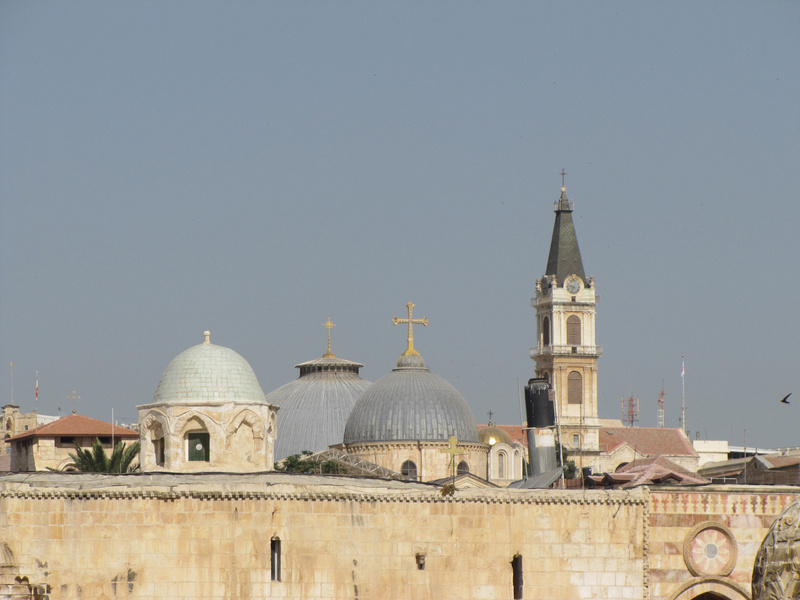 A photo of the two grey domes of the Church of the Holy Sepulcher as seen from the Temple Mount. The cross covers Calvary and the larger dome covers the remains of the garden tomb. Church treasurers embezzle $16 Billion out of church funds each year. This exceeds the entire cost of all foreign missions worldwide. 250 of the 300 largest international Christian organizations regularly mislead the Christian public by publishing demonstrably incorrect or falsified progress statistics. 40% of the church's entire global foreign mission resources are being deployed to just 10 over-saturated countries which already possess strong citizen-run home ministries. "At this the high priest Ananias ordered those standing near Paul to strike him on the mouth. 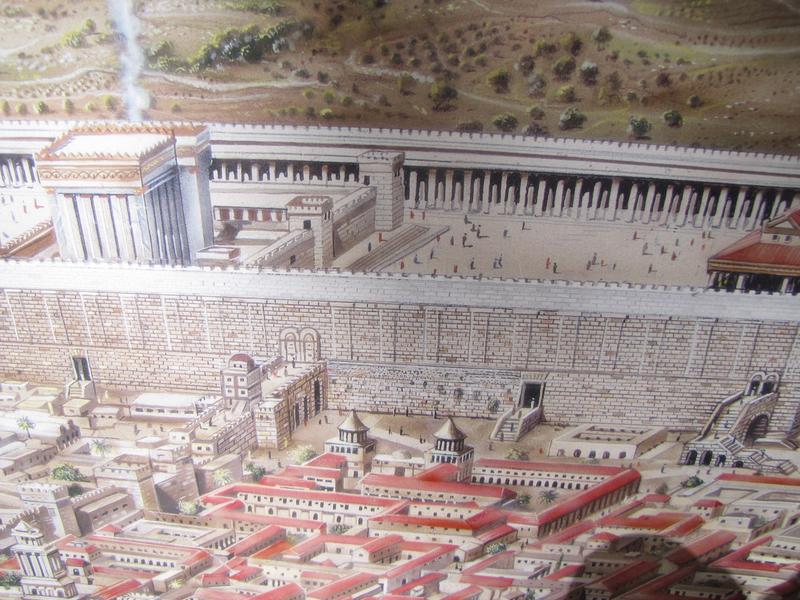 Then Paul said to him, 'God will strike you, you whitewashed wall!' "
In agreement with the biblical account, Josephus records that between the years 47-59 AD the high priest was Ananias son of Nedebaios. "The wealth of the wise is their crown, but the folly of fools yields folly." Be good today and say kind things to people. 3 Every high priest is appointed to offer both gifts and sacrifices, and so it was necessary for this one also to have something to offer. 4 If he were on earth, he would not be a priest, for there are already priests who offer the gifts prescribed by the law. 5 They serve at a sanctuary that is a copy and shadow of what is in heaven. This is why Moses was warned when he was about to build the tabernacle: “See to it that you make everything according to the pattern shown you on the mountain.” 6 But in fact the ministry Jesus has received is as superior to theirs as the covenant of which he is mediator is superior to the old one, since the new covenant is established on better promises.